I have had a busy last few weeks and really not by any sort of choice. First, I found myself with a full week of jury duty, which saw me spending full days at the courthouse. While the experience was educational and informative, I am glad to once again have control over my schedule. Unfortunately, right at the end of my jury service, my dad had an accident and broke eight ribs; two of the ribs were displaced and he also had a Hemothorax. Needless to say, I flew to be with him as soon as I could, and I spent six days visiting him. He is, unfortunately, still in the ICU, so I will likely be traveling to see him again shortly. I am hoping and praying for good news soon. It would be great to see him finally turn the corner. Yes, 2019 has not been kind to me thus far. In an effort to distract myself and do something productive, I’m sitting down to write up a dish I actually prepared weeks ago: Alton’s Coq au Vin. Coq au Vin is an old French dish that was originally composed as a means of cooking old, tough roosters (I was informed of this fact by both Alton and my dad). This dish certainly takes some time to prepare and you need to start a day ahead of eating. Salt pork is the first ingredient in this recipe, but you can substitute slab bacon if you are unable to find the salt pork. I lucked out and found salt pork at my local grocery store. 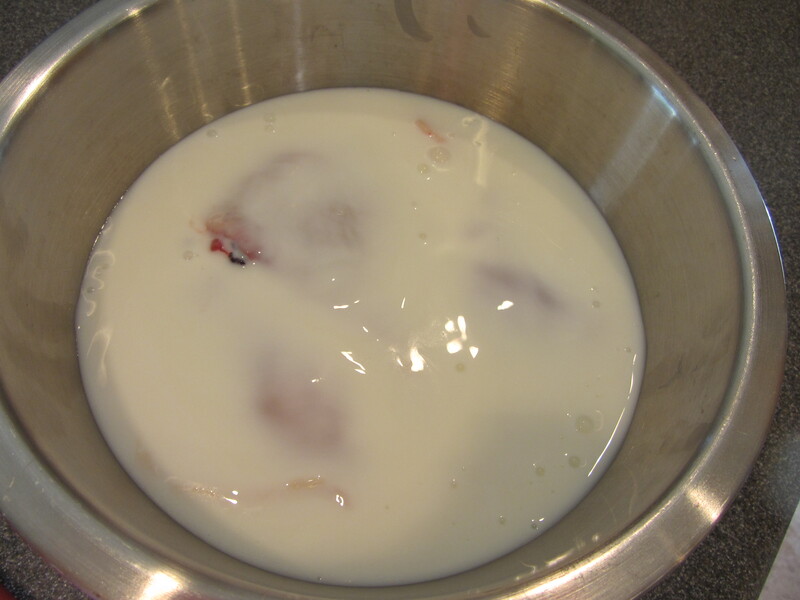 Cube six ounces of the salt pork and place it in a large skillet over medium heat, along with 2 T water. Cover the skillet and let the pork cook for 5-10 minutes. Cubed salt pork in skillet with water. While the pork cooks, place four chicken thighs and four chicken legs on a metal rack over a sheet pan and season them liberally with Kosher salt and pepper. Chicken thighs and legs seasoned with Kosher salt and pepper. 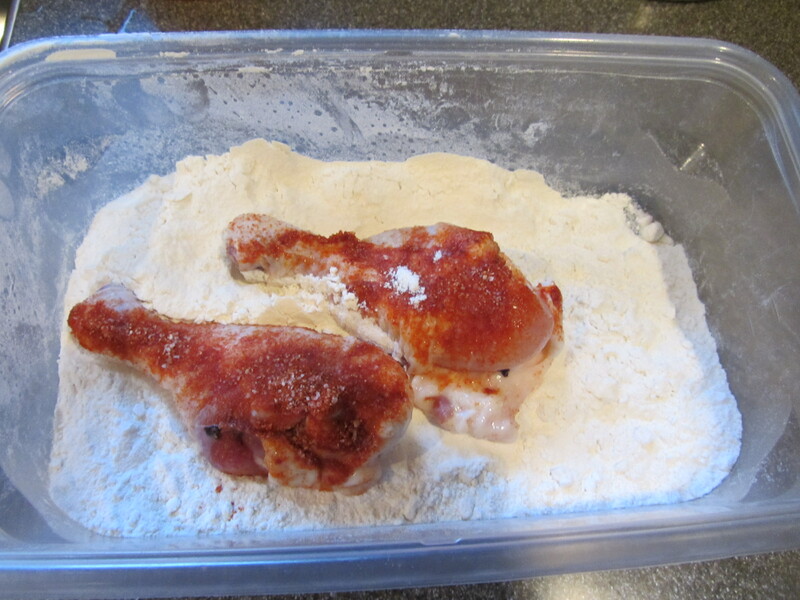 Put 1/4 to 1/2 C flour in a large plastic bag and add a few pieces of the seasoned chicken at a time. Shake the bag to coat the chicken pieces with the flour until all of the chicken has been coated. Set the coated chicken pieces back on the wire rack and set them aside. 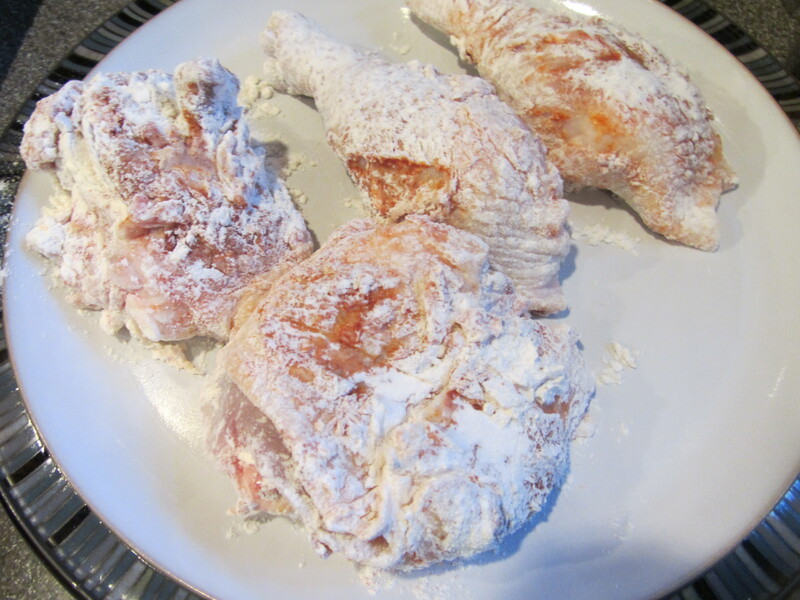 Seasoned chicken pieces in plastic bag with flour. When the pork has darkened in color and has rendered some of its fat, remove the lid from the skillet and continue to cook the pork until it is crispy and brown. Salt pork after rendering some fat. Salt pork cooked until brown and crispy. Remove the pork from the pan and add 24-30 pearl onions to the pork fat. You will need to peel your pearl onions prior to using them; you can do this easily by cutting off the root end of each onion and cutting a deep V where the root was. Place the onions in boiling water for a minute and let them cool. Once cool, the skins should slide right off. Root end removed from pearl onion. A deep V cut into the root end of each pearl onion. Onions in boiling water for 1 minute. 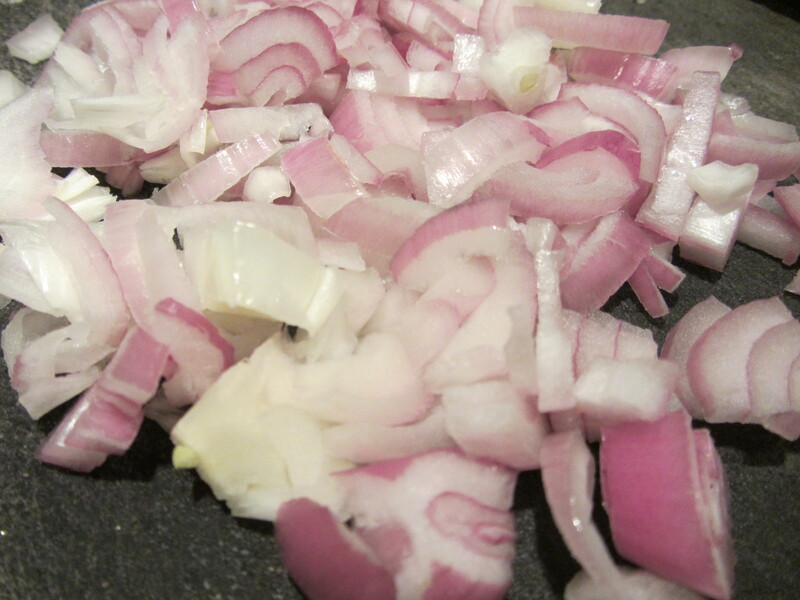 Cook the peeled onions in the pork fat until they are golden brown, and then remove them from the pan. Pearl onions added to pork fat. Pearl onions cooked until golden. 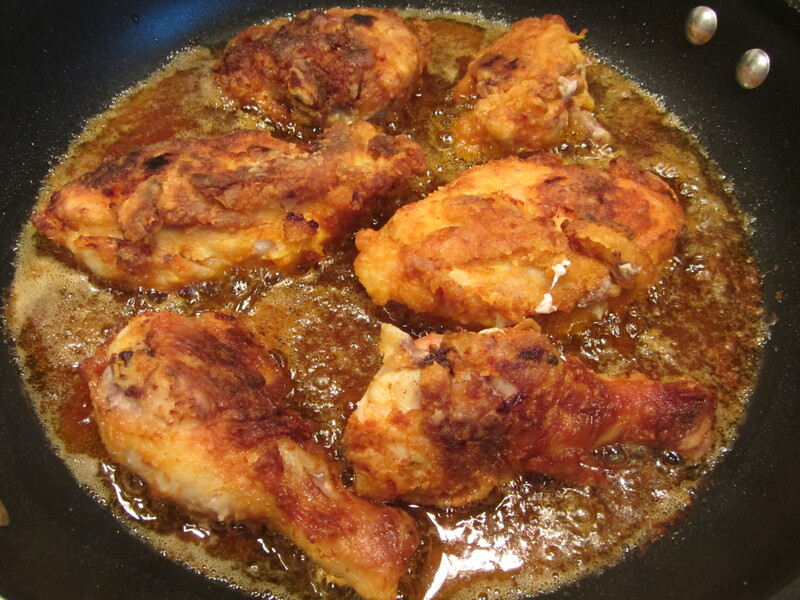 Next, add three or four chicken pieces to the skillet and cook the chicken until it is golden brown on all sides. 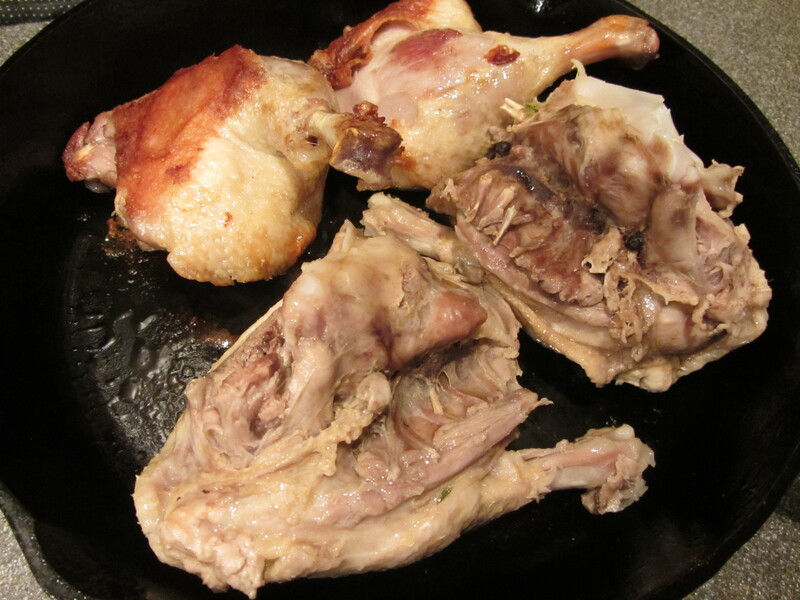 Chicken pieces browning in pork fat. 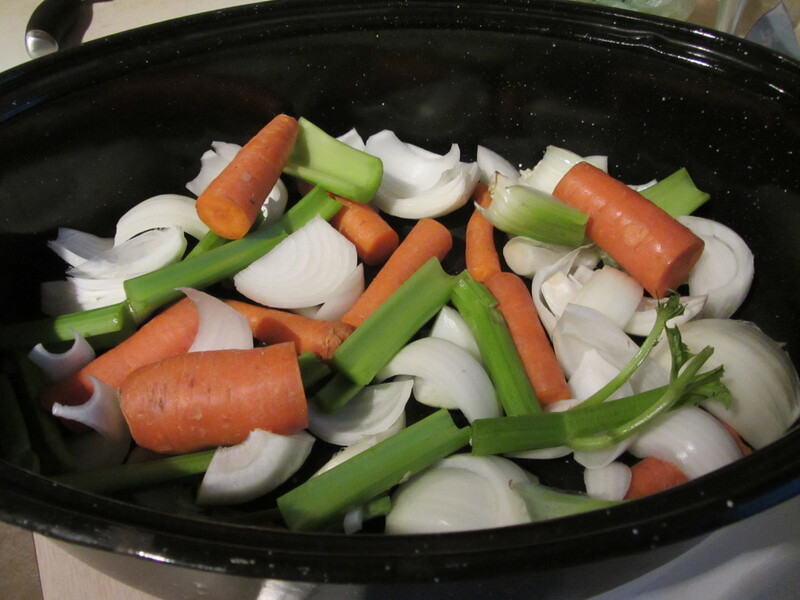 While the chicken browns, prepare a “bed” for the browned chicken by placing the following ingredients in the bottom of a Dutch oven: two quartered ribs of celery, two quartered carrots, a quartered onion, 6-8 fresh Rosemary sprigs, three crushed garlic cloves, and one Bay leaf. Vegetable bed in Dutch oven: celery, carrot, onion, Rosemary, garlic, and a Bay leaf. 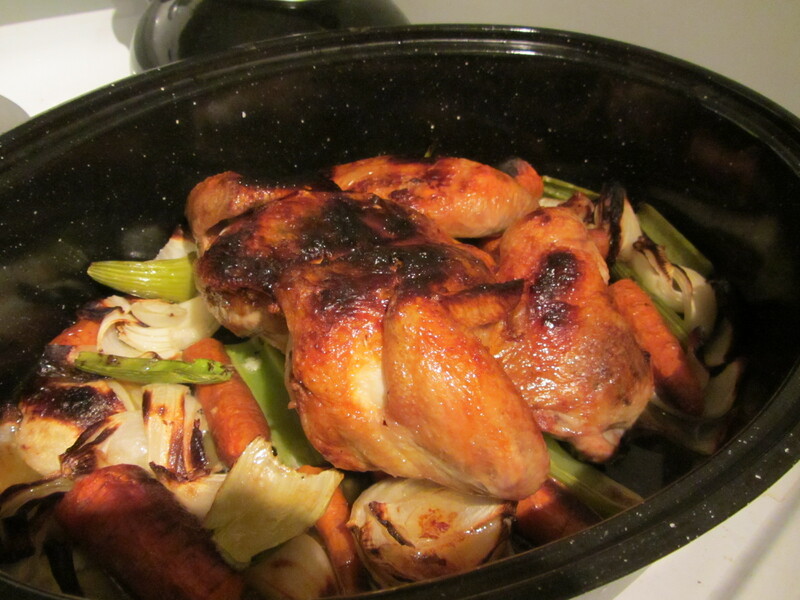 As the chicken pieces finish browning, place them on top of the vegetables in the Dutch oven. 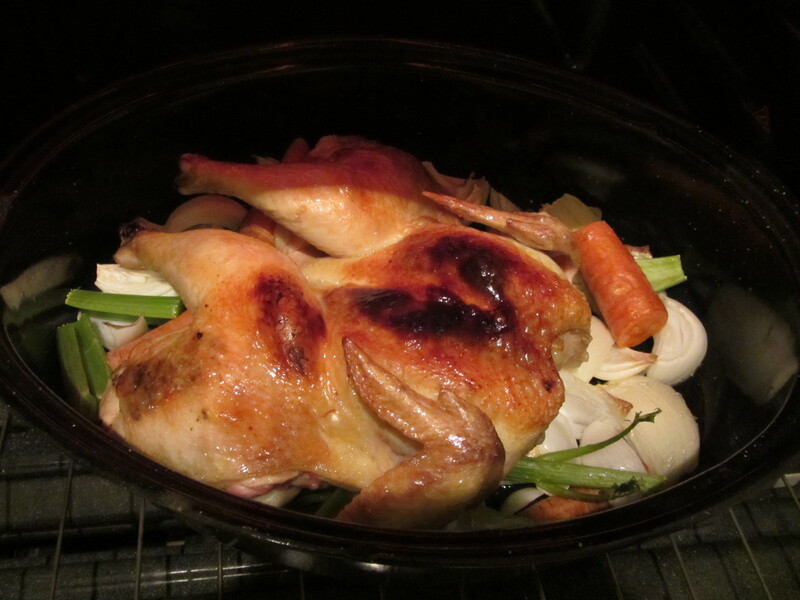 Browned chicken placed on vegetables in Dutch oven. When all of the chicken has been browned, add 1 T butter to the skillet, along with eight ounces of quartered mushrooms. Scraping the pan, cook the mushrooms for about five minutes, or until they are golden brown. Remove the mushrooms from the pan, let them cool, and combine them in a container with the cooled pork and onions. Set the mushroom mixture in the refrigerator until the next day. 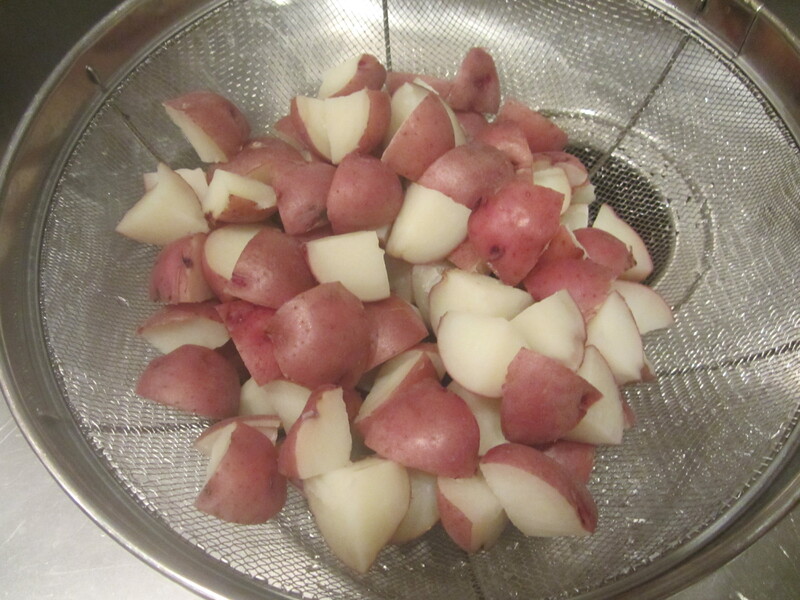 Pour any excess fat out of the pan and discard it (I had very little extra fat in my pan). Remove the pan from the burner and add 1 C Pinot Noir to deglaze the pan, scraping the bottom with a spatula. Pinot Noir added to deglaze pan. Add 2 T tomato paste to the skillet, stirring to combine, and pour the liquid over the chicken in the Dutch oven. Tomato paste added to deglazing liquid. Deglazing liquid poured over chicken. Finally, add 2 C chicken broth to the chicken, along with the rest of the open bottle of wine and another full bottle of Pinot Noir. Two bottles of Pinot Noir. 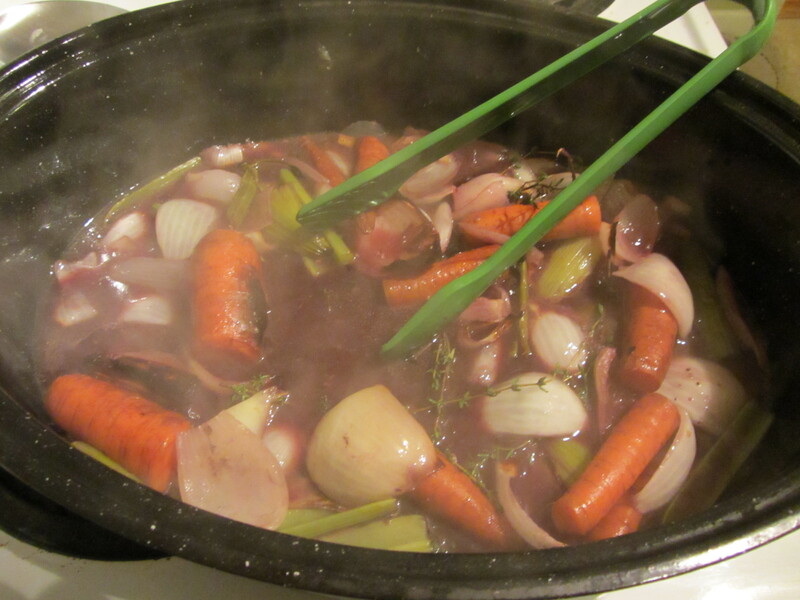 Chicken broth and remaining wine added to chicken and Dutch oven placed in refrigerator overnight. Put a lid on the Dutch oven and place it in the refrigerator overnight. The following day, place the Dutch oven in a cold oven and set the oven to heat to 325 degrees. 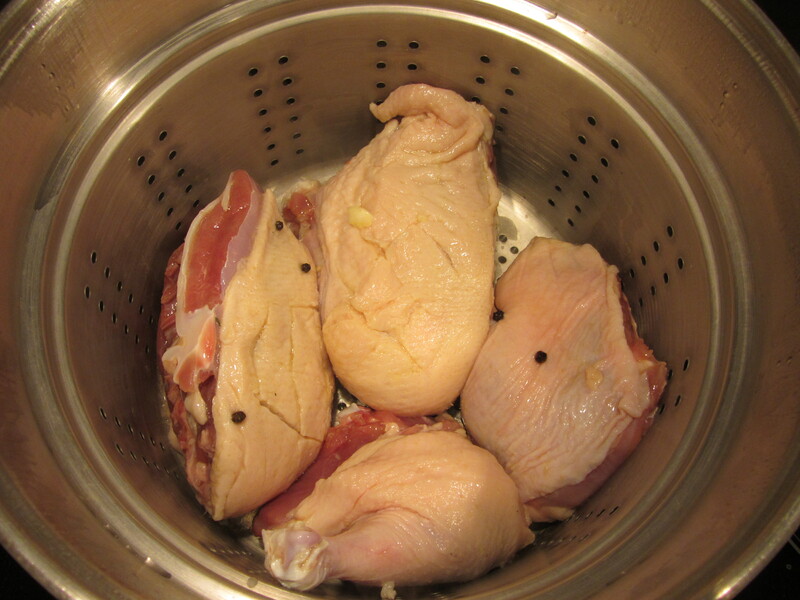 Set a kitchen timer for two hours and check the chicken a few times to be sure it is submerged in the cooking liquid. After the two hour cooking period, remove the Dutch oven from the oven and use tongs to transfer the chicken from the Dutch oven to a packet of foil. 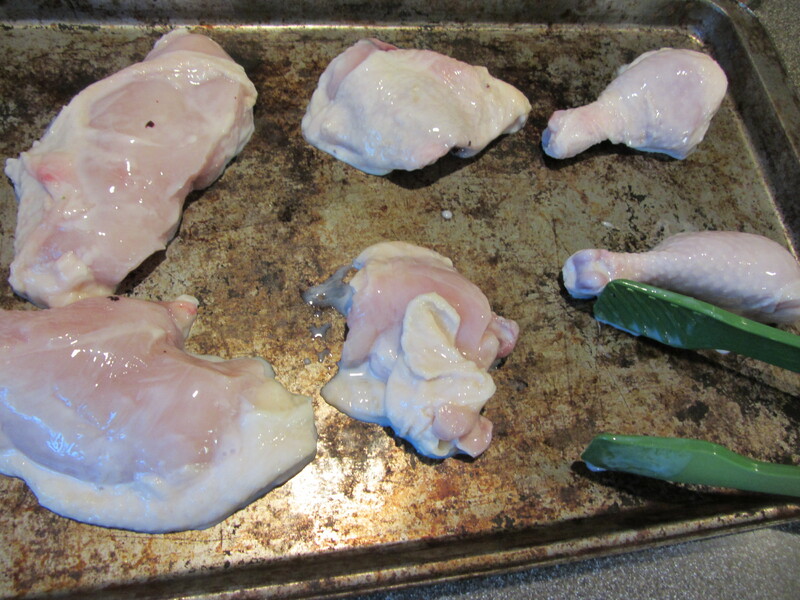 Place the foil packet of chicken in the cooling oven to keep warm. Chicken after cooking for two hours. 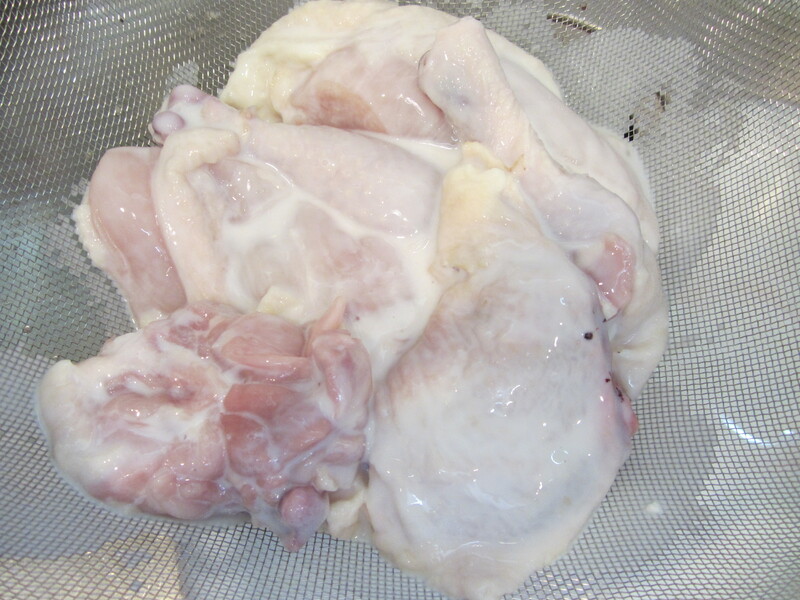 Chicken removed from cooking liquid. Strain the cooking liquid into a saucier, discarding the vegetables (or you can feed them to your dog, as Alton did in the episode). 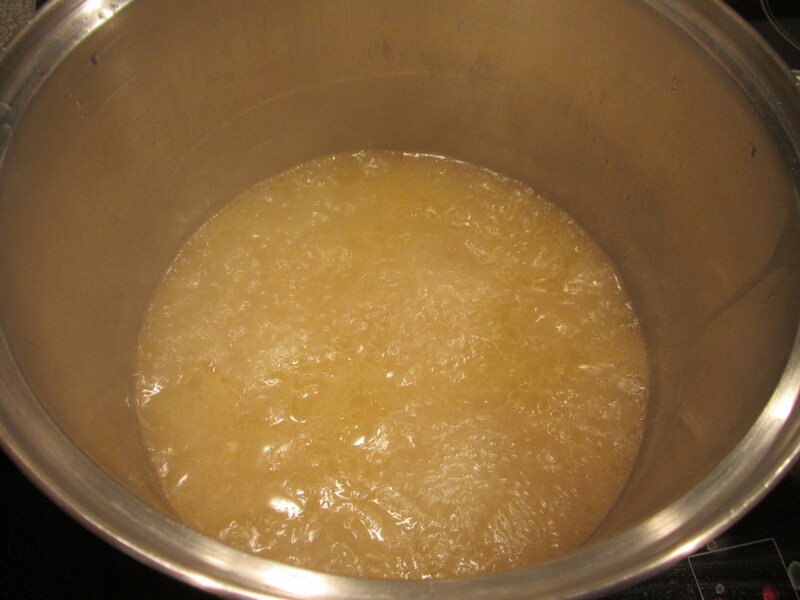 Cooking liquid after removing chicken. Place the saucier over high heat and reduce the liquid by one third, which should take about 30 minutes. You can check the fluid level by placing a rubber band around a long spoon handle at the initial fluid level. When that level has dropped by 1/3, you are good to go. Cooking liquid placed in saucier over high heat. A rubber band is used to measure fluid reduction. Reducing the sauce by 1/3. Sauce after reducing by 1/3. Once the sauce has reduced, add the onions, mushrooms, and salt pork to the saucier and cook for 15 more minutes. Salt pork, onions, and mushrooms added to sauce. Serve the chicken and sauce over cooked egg noodles. Coq au Vin served over egg noodles. This is a really delicious recipe, but it does take some effort and time. For me, it took two and a half hours of prep the first day, followed by the cooking time the second day. I would certainly consider this to be a special occasion dish simply because of the amount of prep. We did, however, get several meals out of this one recipe, so perhaps the time per meal is not much. The chicken in this dish comes out super moist and tender, and has a slight purple hue. The sauce has many layers of flavor, but is light in body. If you want a chicken dish that can serve a group and results in perfectly cooked chicken with lots of flavor, this is the one. Alton Brown fans probably know that he is going to back on our TVs starting Monday. He is going to revisit Good Eats, revamping the old recipes he is unhappy with, and adding new methods, techniques, and information. I am anxious to see which recipes he chooses to alter, as there have certainly been some less than perfect recipes along the way. Of course, there have also been some fantastic recipes that have become mainstays in our house. Now, back to my personal assessments of Alton’s original Good Eats. Alton’s beef paillard calls for a good cut of meat, namely beef tenderloin. To serve four people, he calls for a pound of beef. Since it was just the two of us, I had the butcher cut us a couple steaks from the tenderloin, rather than buying a larger cut of tenderloin. Prior to cooking, place your meat in the freezer for two to three hours, as this will make it easier to cut thin slices. When your meat has chilled, remove it from the freezer and slice it into thin slices; Alton used an electric knife for this, but I used a sharp chef’s knife. Beef tenderloin, after freezing for two hours. Place the slices of beef between sheets of plastic wrap, spritzing the beef and the plastic with water (this decreases friction and prevents tearing of the meat and plastic). Pound the meat until it is very thin – probably about 1/8-inch thick. Sliced beef tenderloin spritzed with water and placed between sheets of plastic wrap. When all of your meat slices have been pounded, heat a large cast iron skillet over medium heat for a few minutes. Cast iron skillet, heating over medium heat. While the skillet heats, brush both sides of the meat slices with vegetable oil and sprinkle them with pepper and Kosher salt. Paillards of beef tenderloin, brushed with vegetable oil and seasoned with pepper and Kosher salt. 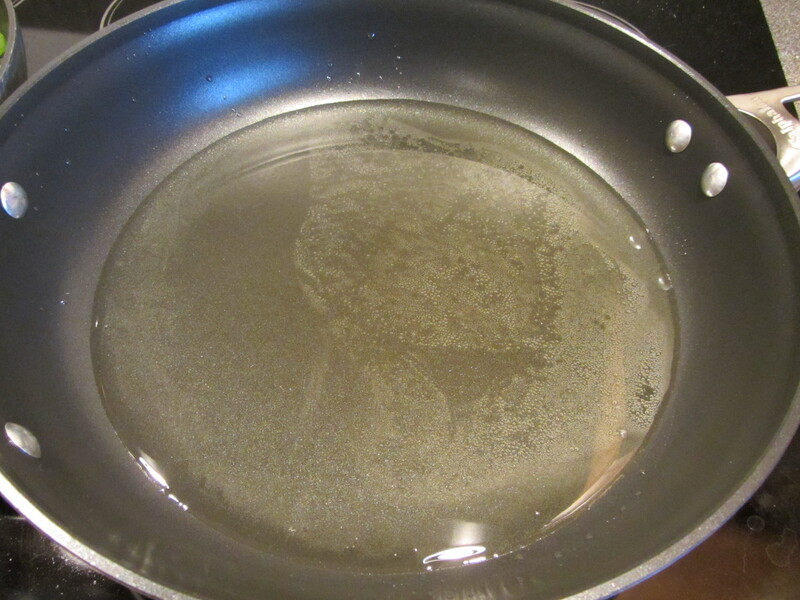 Once the skillet is hot, invert the pan and brush the back of the skillet with vegetable oil. Place the beef paillards on the inverted skillet and they should begin sizzling immediately. Alton said his beef took about 10 seconds per side, but I would say that mine took about 30 seconds per side. I would err on the side of caution here, as you really do not want to overcook the beef. Paillards added to oiled skillet. Paillards, flipped after cooking on one side. Transfer the beef slices to plates, drizzle them with olive oil, and garnish them with some capers, shaved Parmesan, and greens. Alton’s beef paillards with olive oil, capers, greens, and shaved Parmesan. With this recipe, my biggest concern was that I would overcook my beef, but it turned out perfectly. The meat was amazingly tender and seemed to melt in your mouth. And, Alton’s garnishes of olive oil, Parmesan, capers, and greens were spot-on, complimenting the flavor of the beef without overpowering it. The salty nuttiness of the Parmesan, along with the tang of the capers was just perfect with the fruitiness of the olive oil. The best part of this recipe is that it is worthy of a special occasion, yet you can put it together in a very short period of time. This is a recipe that, in my opinion, needs no revamping. While I had previously eaten chicken piccata (piccata means “sharp”), I had never before had a version with turkey. Alton’s recipe calls for a whole turkey breast, which, surprisingly, was just impossible for me to find. I had to settle for some pre-sliced turkey breast, as that was all I could find after going to numerous stores. If you are able to find a whole turkey breast, slice it into half-inch slices. Place the slices between sheets of plastic wrap, spritz them with water, and pound them until they are twice their original size. Slice of turkey placed between sheets of plastic wrap. Season the top sides of your pounded slices of turkey with Kosher salt and pepper, and place them, seasoned sides down, in a pie plate of flour. Season the second sides of your slices of turkey and coat them also with flour, shaking off any excess. Pounded turkey, seasoned with Kosher salt and pepper. Turkey slice, seasoned side down, in flour. Second side of turkey seasoned with Kosher salt and pepper. 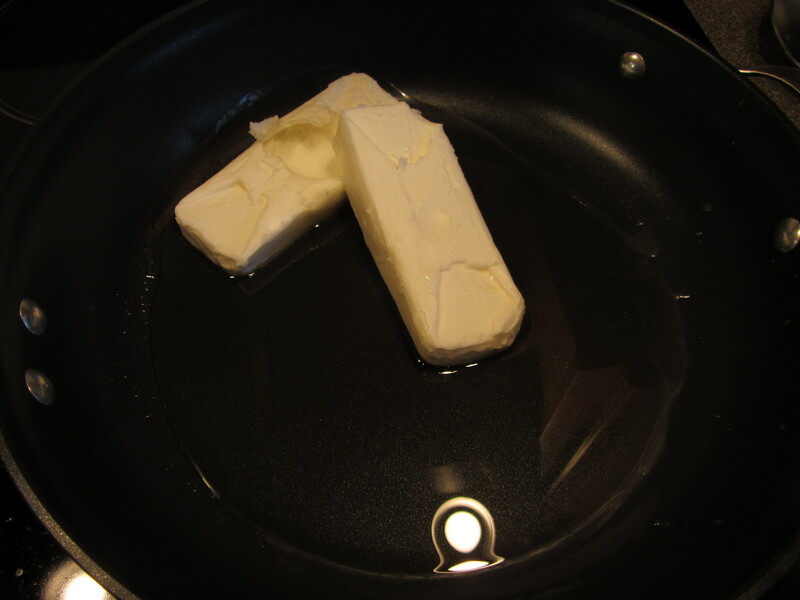 Next, heat 4 T unsalted butter and 2 T olive oil in a large skillet over medium-high. Butter and olive oil in skillet. Melted butter with olive oil. When the butter has melted, add the floured turkey slices to the pan, cooking them until golden (about two minutes per side). Seasoned/floured turkey added to skillet. Move the cooked turkey slices to a foil packet and keep them warm in a 200 degree oven while you make the sauce. Cooked turkey transferred to foil packet. To the pan in which you cooked your turkey, add 2 T chopped shallots, cooking for about a minute. Shallots added to the pan. Add 1/2 C white wine and 1/3 C fresh lemon juice to the pan, allowing it to simmer for two to three minutes. Wine and lemon juice added to the pan. Finally, whisk 2 T butter into the sauce. Butter, stirred into the sauce. Spoon the sauce over the warm turkey slices, garnishing with parsley, capers, and peppercorns, if desired. Capers added to finish the sauce. I had mixed feelings about this recipe because I found the sauce to be tangy and delightful, but my turkey was tough. I see that Alton tells you to cook the turkey for only one minute per side in the online recipe, but he cooked his turkey for two minutes per side in the episode, which seemed to be too long. I also think my turkey piccata would likely have been better if I could have found a whole turkey breast and sliced it just prior to cooking. I’m tempted to give this one another try because the sauce was smooth, buttery, and full of lemon tang. I would recommend opting for chicken if a whole turkey breast is unavailable. Chicken Kiev is something I remember my mom making once or twice. She viewed it as a special occasion dish, as her mother served it to her father’s business clients who came to dinner. Chicken Kiev is actually of French, rather than Russian, origin, but was brought to Russia by the French in the 18th century. I remember my mom sometimes being frustrated with her Chicken Kiev because the filling would leak out during cooking. Having never made it before, I was hoping Alton’s recipe would keep my filling intact. This is a recipe that you will want to start at least two hours prior to serving, or even the night prior. The first step of this recipe is making a compound butter by combining a stick of softened unsalted butter, 1 t dried parsley (I used fresh, so I used twice as much), 1 t dried tarragon, 1 t Kosher salt, and 1/4 t pepper in a stand mixer. Butter, parsley, dried tarragon, Kosher salt, and pepper. Place the compound butter on wax paper, roll it into a log, and place it in the refrigerator to firm. Compound butter transferred to wax paper. Compound butter rolled into a log. After the butter has firmed up, place a chicken breast between pieces of plastic wrap, spritzing the chicken and plastic with water. Chicken breast in spritzed plastic. Pound the chicken until it is thin enough to roll. Chicken breasts are fairly thick, so it is tedious to get the chicken thin. 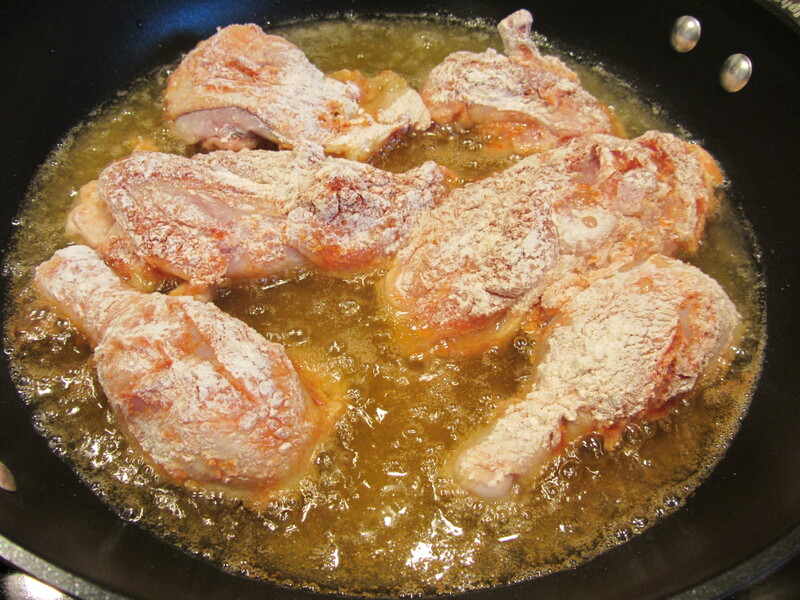 Place a couple slices of compound butter in the center of the pounded chicken, along with 1 T panko bread crumbs. Pounded chicken topped with compound butter and panko bread crumbs. Roll the chicken over the butter and bread crumbs by folding the longest edge of chicken over the filling and then folding in the ends. Continue rolling the chicken, using the plastic to help you roll and keeping the ends tucked inside. Wrap the rolled chicken tightly in plastic wrap and refrigerate at least two hours, or overnight. 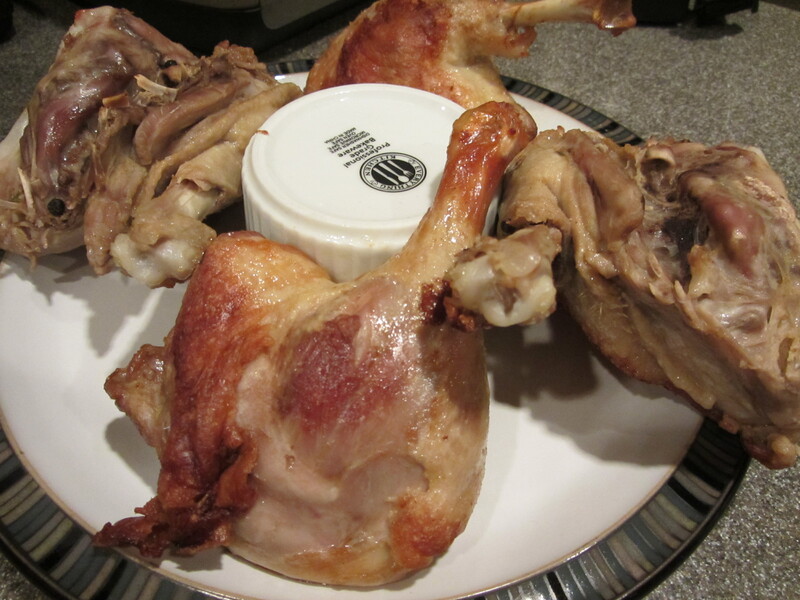 When ready to cook your chicken, roll the chicken in a pie plate containing two eggs beaten with 1 t water. Chilled chicken being rolled in egg wash.
Next, roll the chicken in a plate of panko bread crumbs. Chicken rolling in panko after egg wash. 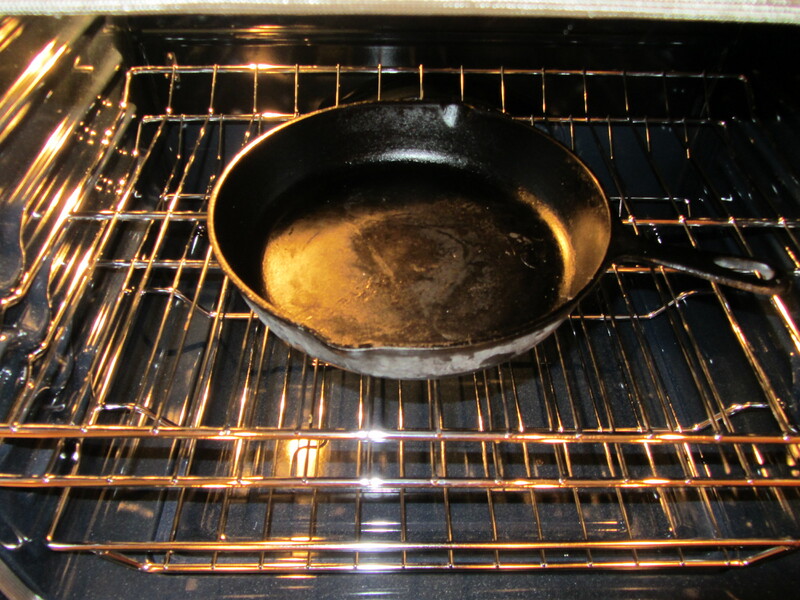 Put a half-inch of vegetable oil in a large skillet and heat it to 375 degrees. Once hot, add the breaded chicken rolls to the pan, cooking for 4-5 minutes per side, or until the internal temperature reaches 165 degrees. Breaded chicken in hot oil. Transfer the cooked chicken to a rack, letting it rest for five minutes. I found that my chicken took considerably longer than 10 minutes to reach 165 degrees inside. You do get some carryover cooking, so I think it is best to pull the chicken from the oil when the internal temperature hits 158-160. Otherwise, your chicken may be slightly overcooked by the time you cut into it. We were pretty happy with Alton’s Chicken Kiev. His method for rolling the chicken worked well, and kept the filling intact for the most part (my one roll split a little bit). It is easier to roll the chicken if you get it really thin, so try to get it as thin as possible before filling/rolling. Also, don’t skimp on the chilling time for the rolled chicken, as the chicken really needs that time to maintain its shape. The panko bread crumbs gave Alton’s chicken a really great crispy crust, and the filling of the chicken had lots of anise-like flavor from the tarragon. I do wish that the compound butter would have melted a bit more, though. I just wouldn’t cook the chicken all the way to 165, as my chicken was just a tad overcooked. My mom can’t really cook anymore because of her Parkinson’s, but I think she likely would have adopted Alton’s Chicken Kiev recipe as her go-to. I actually prepared this dish a couple weeks ago, but I am only now getting around to blogging about it. I know my mother-in-law, Ellie, is concerned about Ted keeping his weight up as he goes through his radiation and chemotherapy. I am doing my best to keep him well-fed, and Alton’s fried chicken was certainly something he had no trouble consuming! I am not a huge fan of preparing chicken, as I have written before. I just find it to be unappealing in its uncooked state. Now, if someone prepares it for me, it’s a different thing. 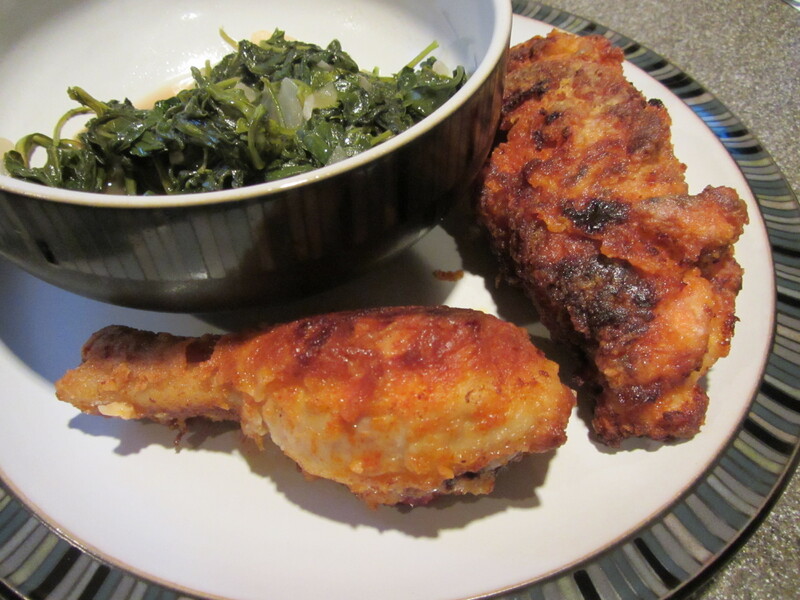 This was my first time making fried chicken, and was the first time I had consumed fried chicken in years. The recipe for Alton’s fried chicken is pretty straight-forward. He recommends getting a whole broiler/fryer chicken, rather than purchasing an already-portioned bird. Why? 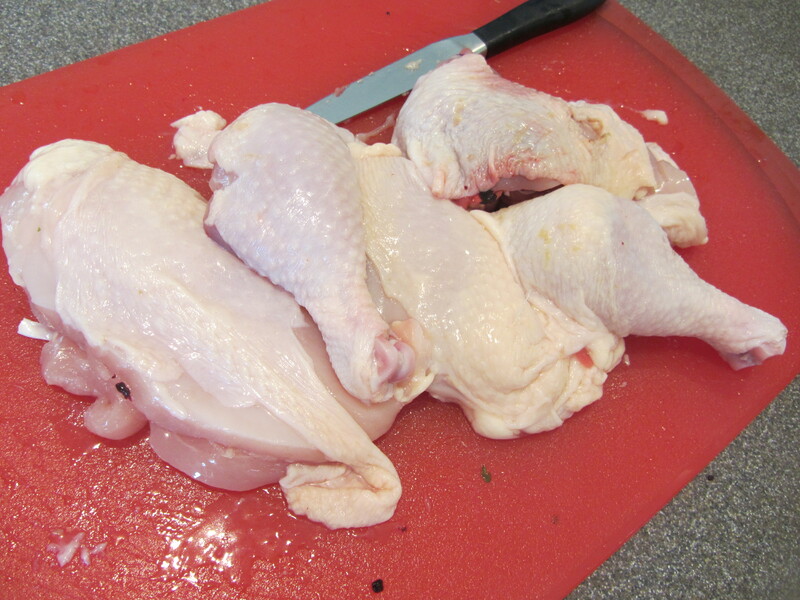 It is cheaper to break down your own chicken, you get better portioning, and the meat stays fresher longer. It is probably best to watch Alton’s chicken breakdown in the episode. To start, place your chicken on a cutting board with the neck facing you. My chicken on a cutting board. Cut the wings off; discard the wings or save to use in making stock. Next, you need to remove the wishbone. You can feel the wishbone if you run your finger over the inside of the neck. Using a sawing motion, you will cut the wishbone out by running your knife down each side until the bone becomes detached. 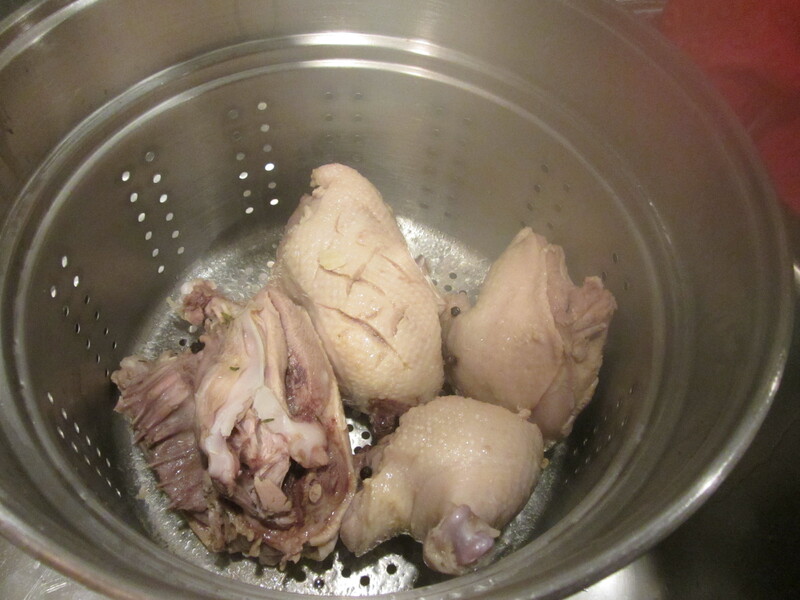 The legs are next; cut through the skin between the breast and the drumsticks. Flip the bird over, feel for the thigh bones, and bend the legs backward toward you, dislocating the joints. Cut the legs off with your knife. Squeeze each leg together to find the joint line, kind of like squeezing a nut cracker. 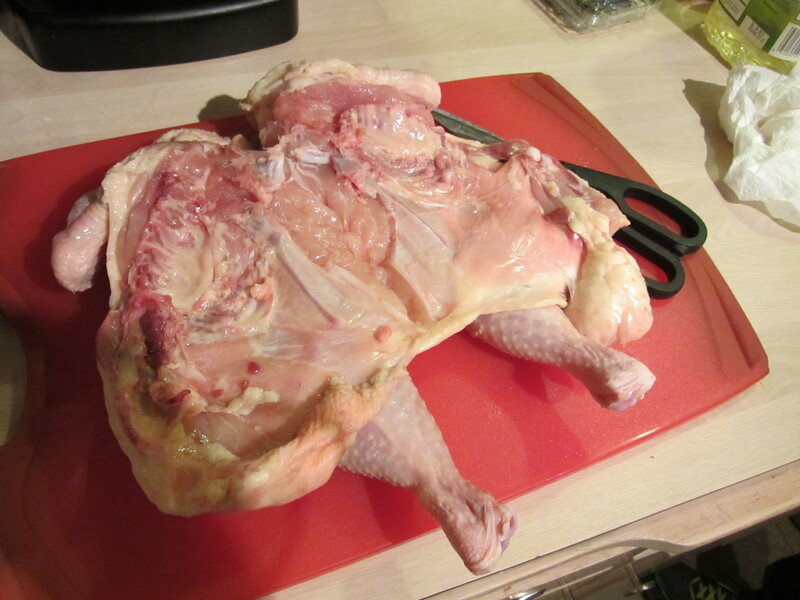 Place the blade of your knife in the joint and slice down to separate the thigh from the drumstick. To portion the breast, cut down one side of the keel bone, and use your knife to “peel” the meat from the ribs. Do the same on the other side. My chicken after portioning Alton’s way. Not a perfect job. Again, it may be easier to watch a video of how to break a chicken down. If desired, you can use the carcass and wings to make stock. 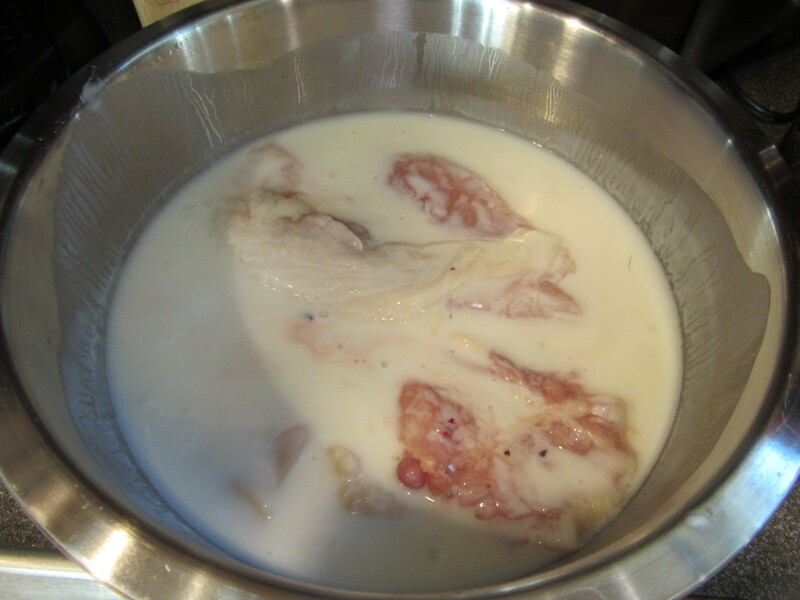 Place your chicken pieces in a container and pour two cups of low-fat buttermilk over them; cover and refrigerate for 12-24 hours. Chicken pieces in a container. Buttermilk poured over chicken pieces. I let my chicken pieces sit for ~24 hours. When ready to fry your chicken, heat solid vegetable shortening in a large skillet (preferably iron); for a 12-inch skillet, use 16 oz. of shortening. 16 ounces of shortening melting in a 12-inch skillet. You want your melted shortening to come 1/3″ up the side. 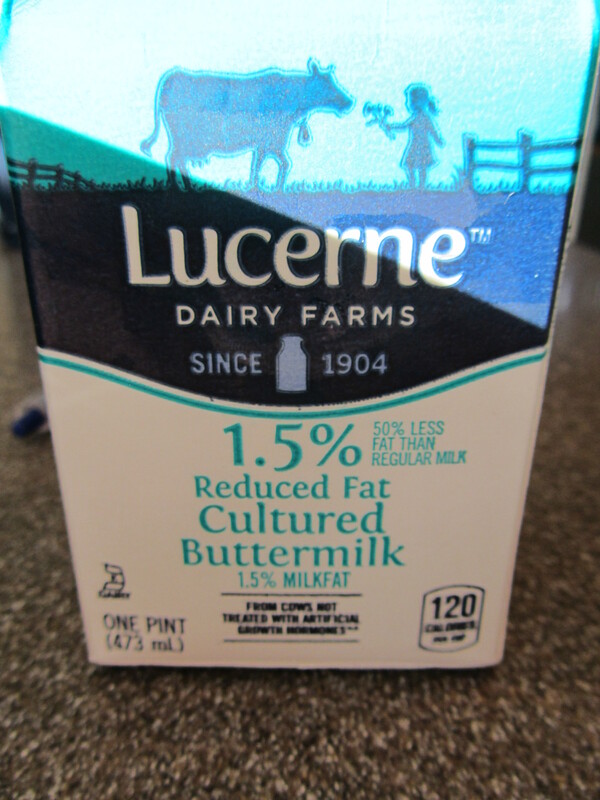 Drain your chicken pieces, discarding the buttermilk. Chicken after soaking in buttermilk for ~24 hours. 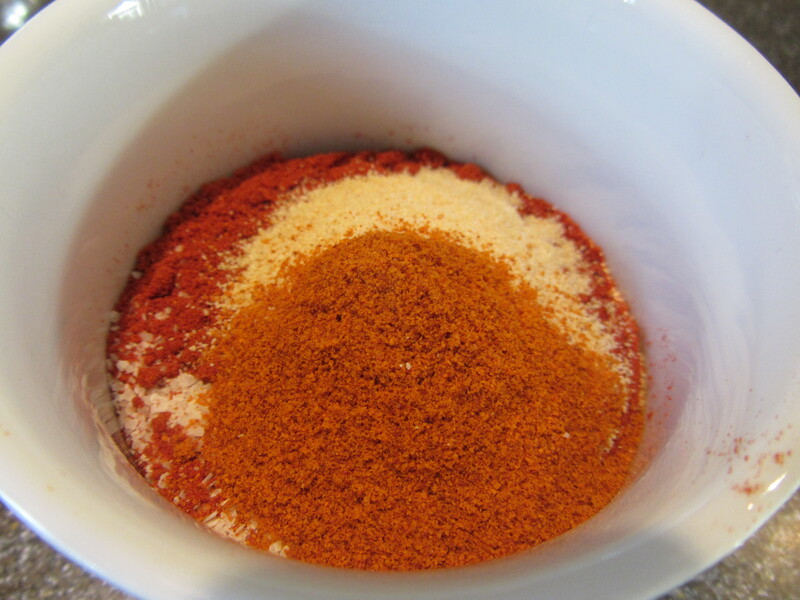 Meanwhile, prepare your seasoning blend by combining 2 T Kosher salt, 2 T paprika (I used hot smoked paprika), 2 t garlic powder, and 1 t cayenne pepper. Alton places his seasoning blend in a shaker for easy dispersion. 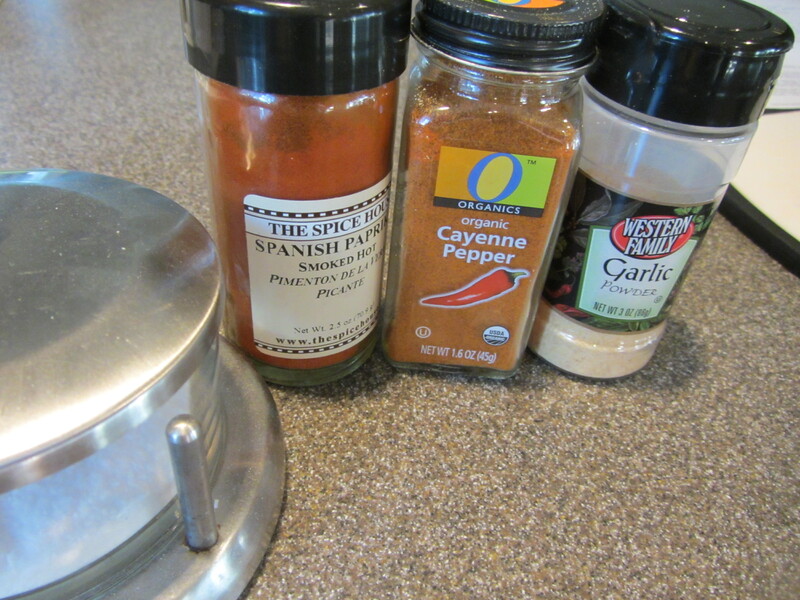 Ingredients for spice blend: Kosher salt, garlic powder, paprika, and cayenne pepper. 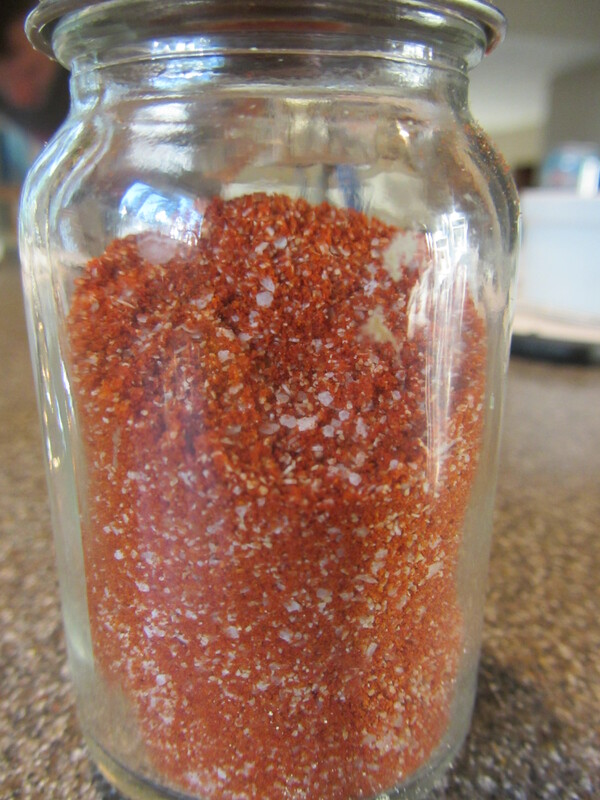 2 T Kosher salt and 2 T paprika. 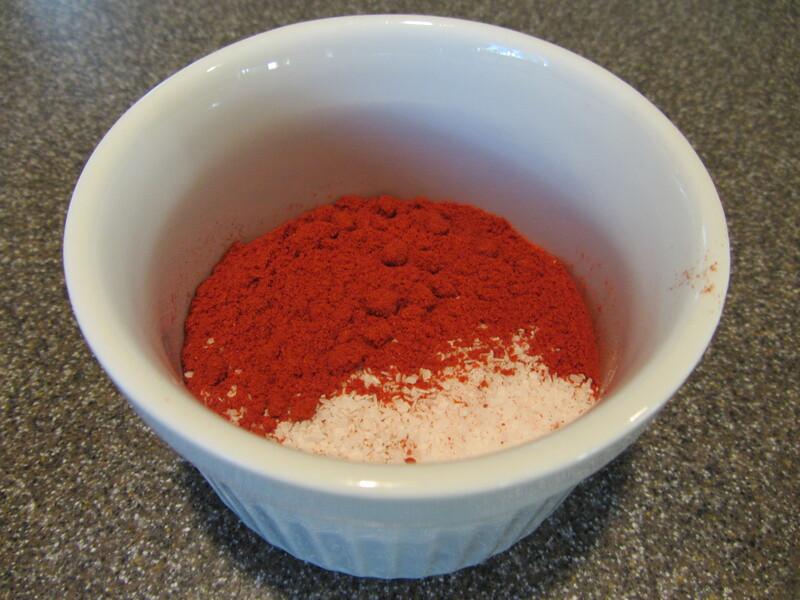 2 t garlic powder and 1 t cayenne pepper added to spice blend. 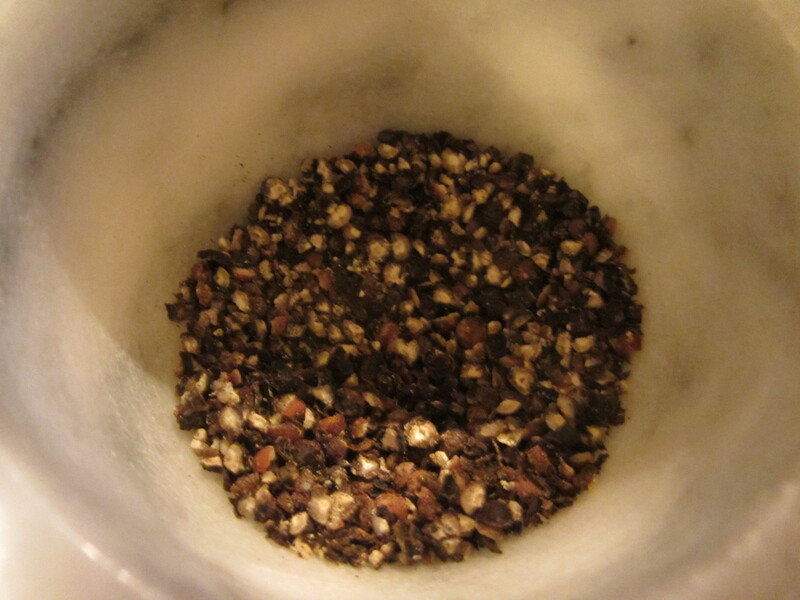 Final spice blend in a shaker. Place your drained meat pieces on a baking sheet and season them liberally on both sides with your blend. Chicken pieces on a baking sheet. 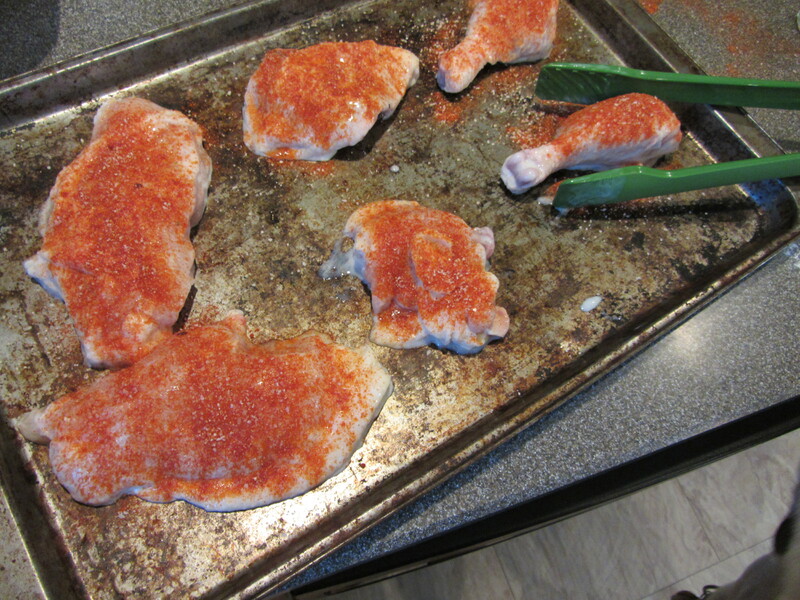 Chicken pieces sprinkled liberally with spice blend. After seasoning, dredge the chicken pieces in flour, shaking off the excess flour. Seasoned chicken pieces being dredged in flour. Seasoning the meat prior to dredging decreases the chance of burning and also leads to less waste of spices. Let the dredged chicken sit for 2-3 minutes. To start frying your chicken, Alton says you want your oil temperature to be a max of 350 degrees. I put my chicken in the pan when my oil was around 325 degrees. Place your breasts, skin side down, at 10 and 2 o’clock in the pan. 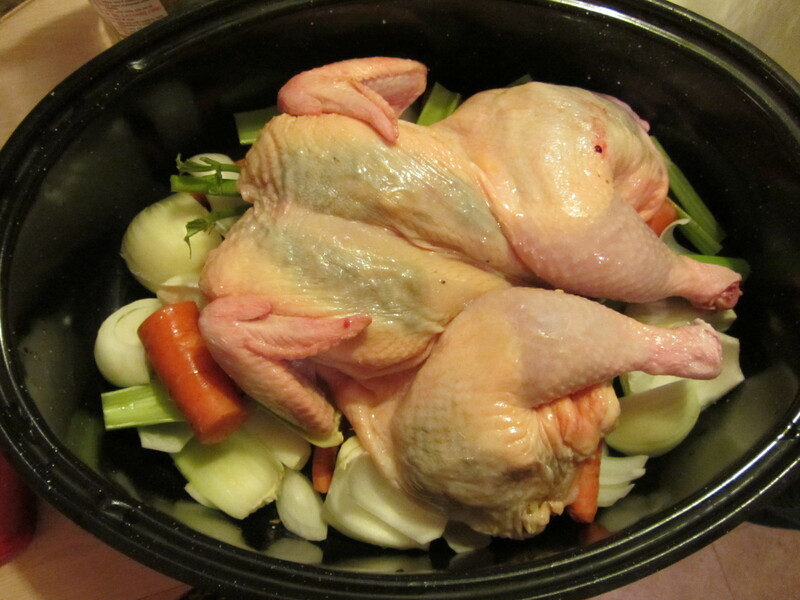 The drumsticks should be placed at 5 and 7 o’clock, and the thighs should go in the center. I did a poor job of portioning my thighs, so they were very small. I opted to place my breasts in the center instead. Chicken pieces added to skillet for 12 minutes. Fry the chicken for about 12 minutes, and flip the pieces to their opposite sides to cook for an additional 12 minutes. Make sure to check your oil temperature frequently, as you do not want it to get any hotter than 350 degrees. I used my infrared thermometer to monitor my oil temperature. Chicken pieces flipped to second sides for ~12 more minutes. When your cooking time is up, check the internal temperature of your chicken to ensure it is cooked throughout; you will want an internal temperature of 180 degrees. Some of my chicken pieces required additional cooking time. Drain your fried chicken on a rack over a sheet pan. It will maintain its heat for quite some time. I have to say that Alton’s fried chicken was pretty spot-on. I heavily spiced my chicken, and that made the flavor quite intense. 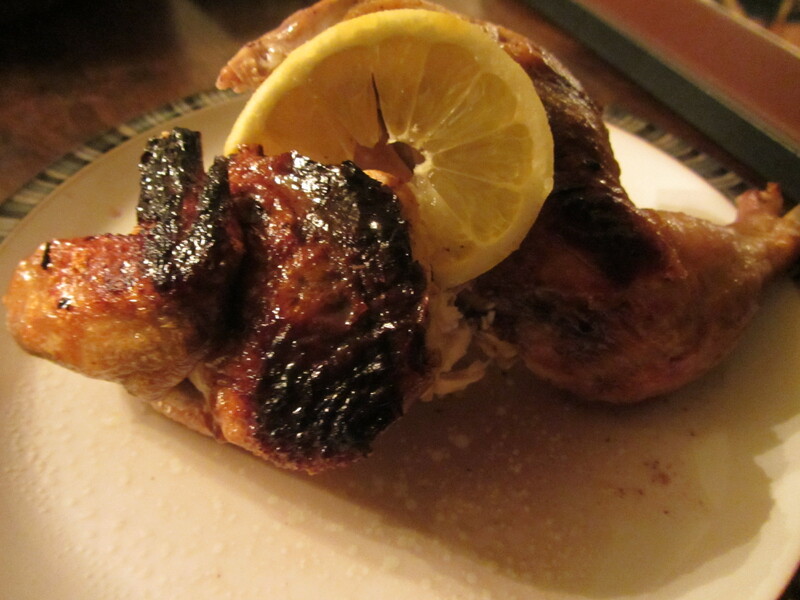 The skin was crispy and relatively low on grease, and the meat inside was tender and juicy. I would definitely make this again. Maybe someday someone will make it for me, as I would prefer to not see the slimy bird before cooking! At least I didn’t start a fire with this frying attempt, as I did with the fish and chips! First of all, I am getting pretty excited to see Alton Brown’s live show in less than a week, especially considering that we bought tickets the day they went on sale, which was about eight months ago. We will be going with my parents, and I think we are all highly anticipating the show. My dad, too, was an avid Good Eats watcher in the past. I have not eaten a lot of duck in my life, but I know some people who have, namely my dad and my husband. There was a stretch of time when Dad and Ted would both order duck when we would all go out to eat, and this went on for months. Seriously, they ate more than their fair share of duck. I feel, therefore, that they can appropriately be deemed Duck Aficionados, or “Quackxperts,” as I prefer to call them. I had some trepidation about preparing duck since I know how critical it is to cook properly, but I hoped Alton wouldn’t let me down. I set out to prepare Alton’s recipe last night, after thawing my duck in the refrigerator for a couple of days. Alternatively, for faster thawing, you could thaw your duck under cold, running water. I had intended to cook my duck on Saturday, which would have necessitated the running water thaw, but the combo of too long of a marathon training run with too little food led to a night on the couch, in lieu of duck prep. 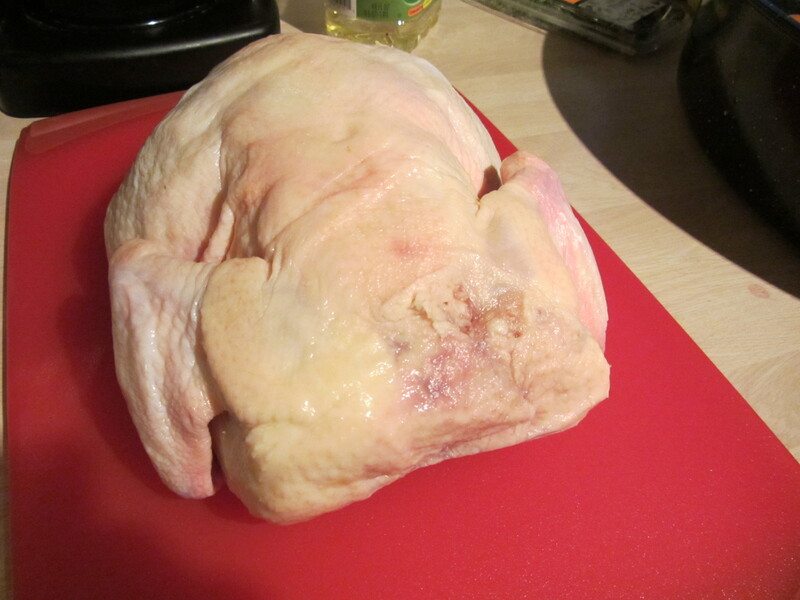 On the plus side, my duck (I named him Donald) was perfectly thawed for dinner last night. 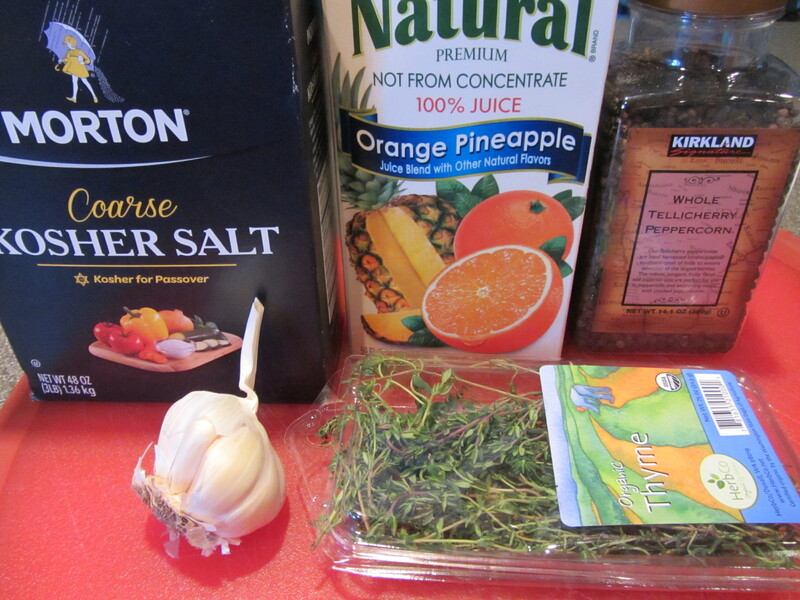 To make Alton’s duck, first mix your brine by combining 1/2 C Kosher salt, a pint of pineapple orange juice, at least 15 black peppercorns, a bunch of fresh thyme, and four smashed cloves of garlic in a leak-proof, lidded container; shake to dissolve the salt. 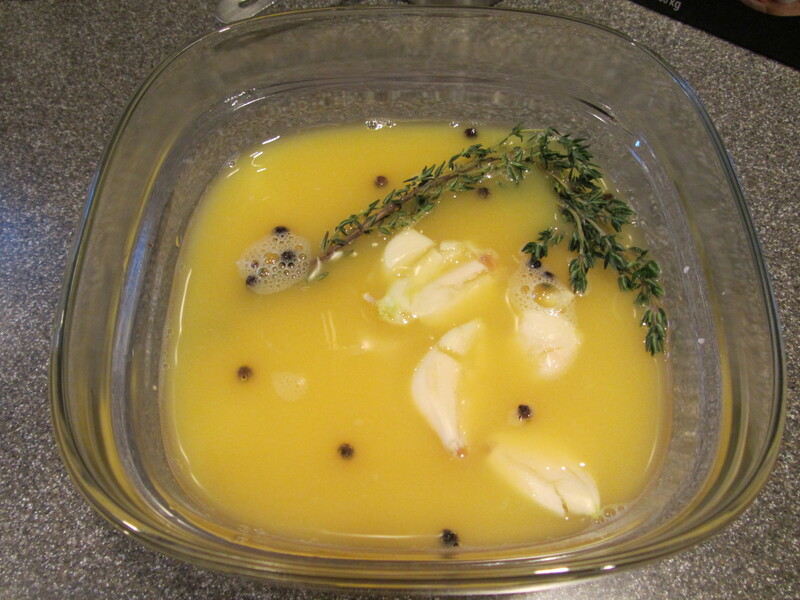 Brine ingredients: Kosher salt, pineapple orange juice, black peppercorns, fresh thyme, and garlic. Next it is time to prepare the duck itself. Place your duck on a cutting board and discard all of the innards. With a knife, slice through each wing to the joint, and break each wing off by bending the joint backward. From the base of the neck, cut along one side of the back bone of the bird with kitchen shears. 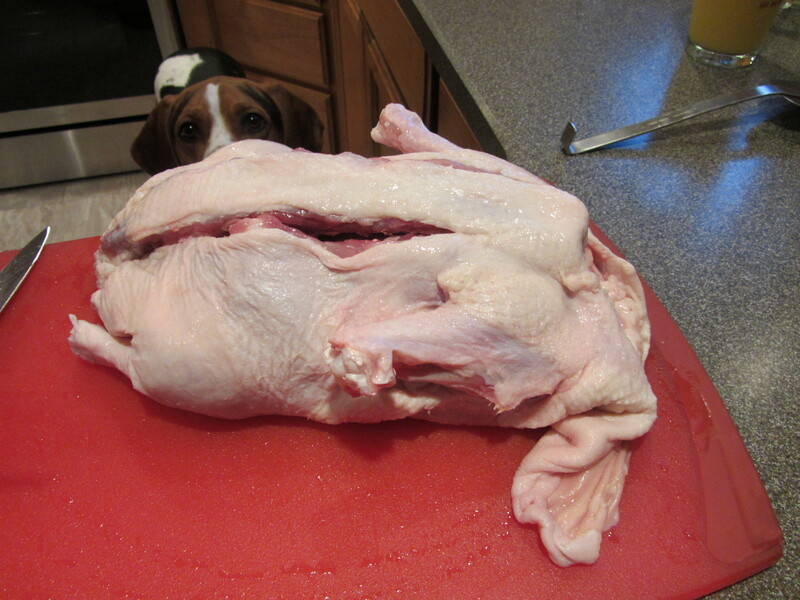 Dog craving duck, as I cut along the back bone. Turn the bird around and cut up the other side of the back bone. It will be tough to cut. Pull the back bone out and discard it. 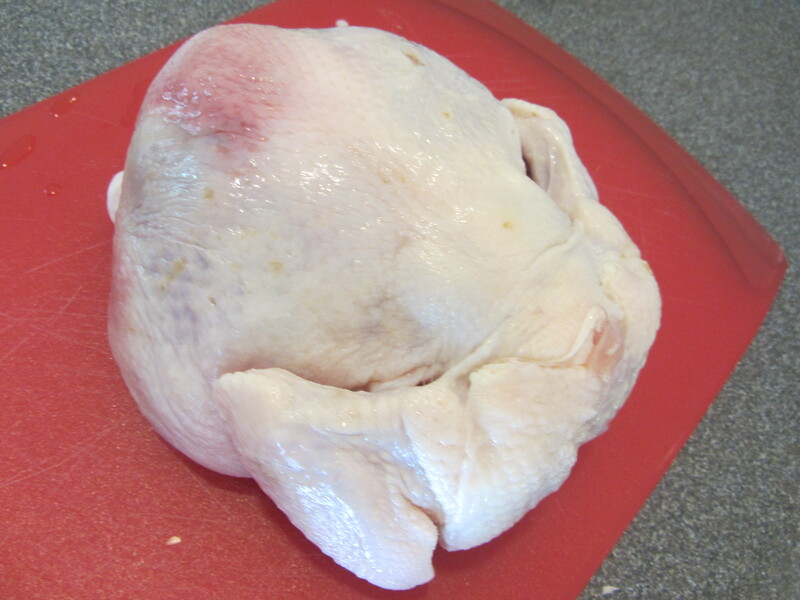 Flatten the duck and flip it over, so the breast is facing up. 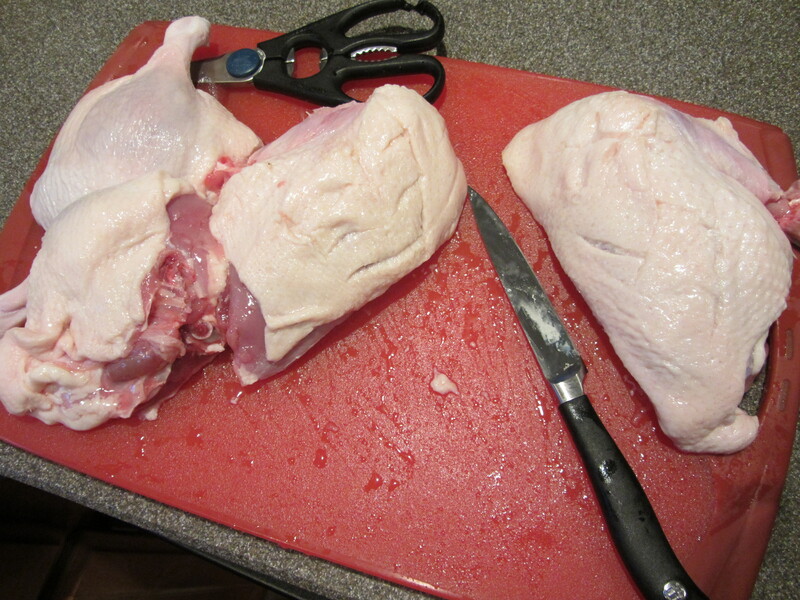 Again, using the shears, cut down the middle of the breast, splitting the duck into two halves. 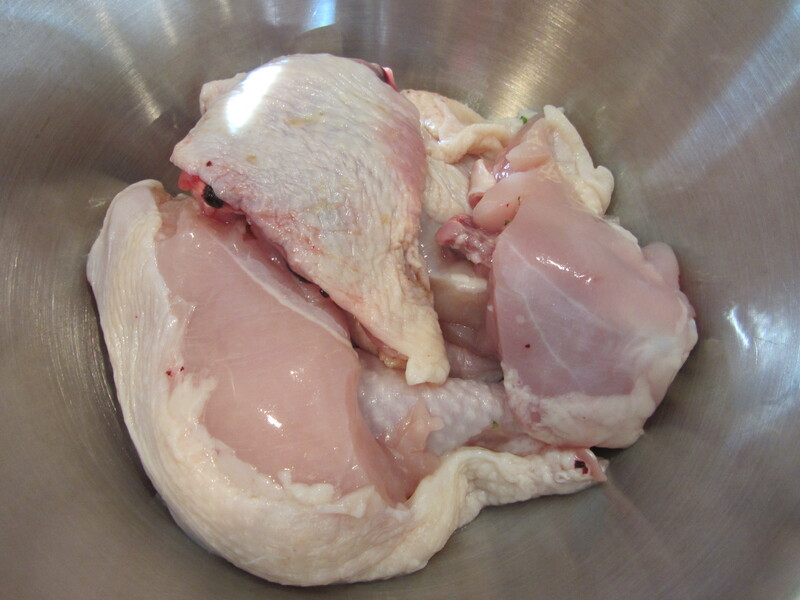 Using a sharp knife, separate the breast from the leg by making a crescent-shaped cut. The duck is now in quarters, with two breast pieces and two leg pieces. The breast quarters have a fair amount of fat, so you want to score the skin of the breast in a grid pattern (three cuts one way, and three the other way) with a sharp knife, taking care only to score the skin; this will allow much of the fat to cook off. Duck halves, cut into quarters. The breast pieces are scored. 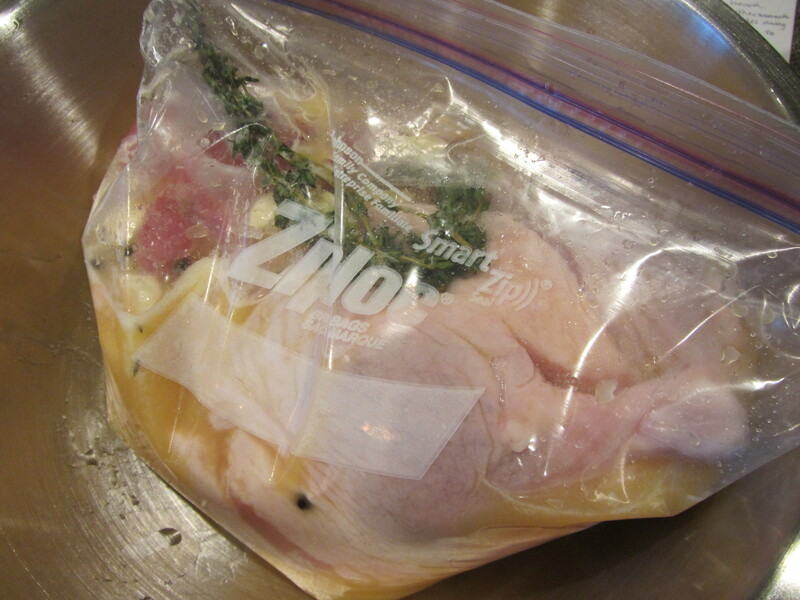 Line a container with a large Ziplock bag, put the duck quarters inside, and pour the brine over the duck, squeezing as much air as possible from the bag. Duck and brine in a bag. Removed as much air as possible from the bag. 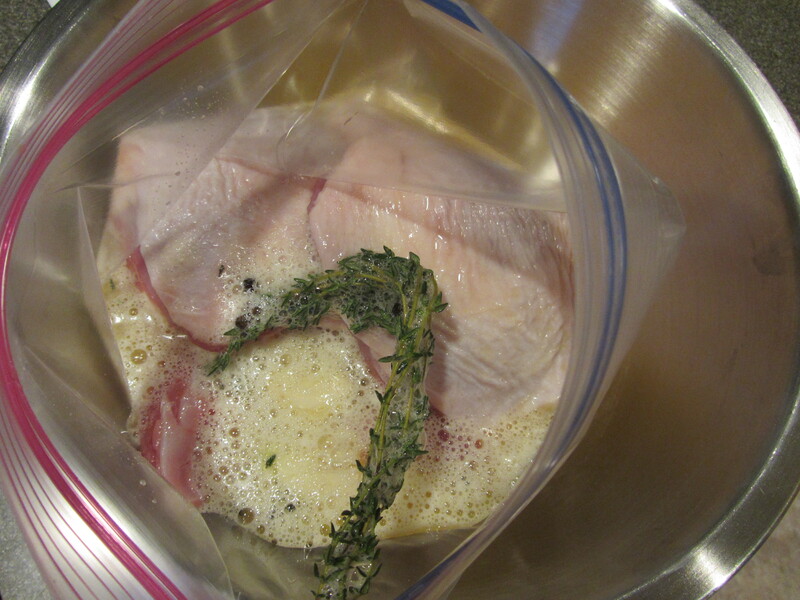 Let the duck brine in the refrigerator for 2-2.5 hours. When ready to cook your duck, bring some water to a boil in a large pot that can hold a strainer or colander; I used our pasta pot. 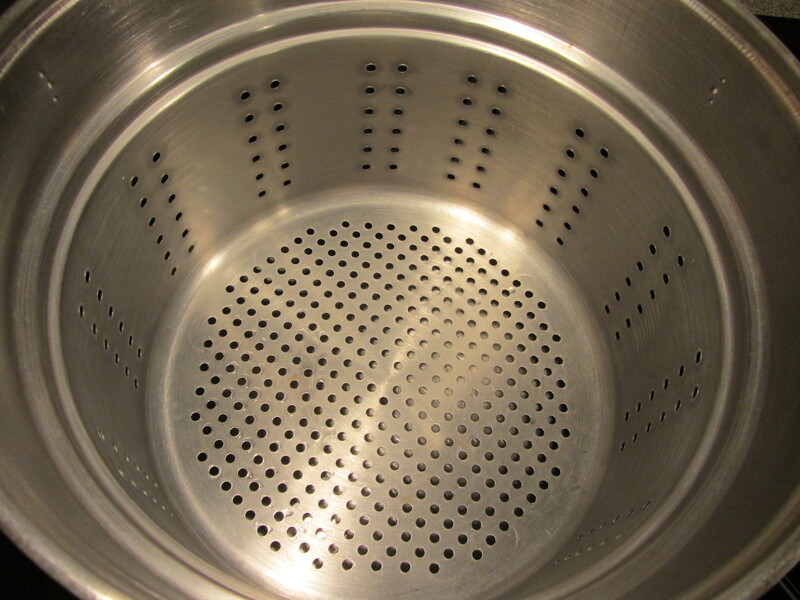 Pasta pot to steam the duck. Place the duck quarters around the sides of the colander, avoiding stacking them on each other, as this can cause uneven cooking. Duck quarters, ready to be steamed. Cover the pot, decrease the heat, and steam the duck for 45 minutes. If your dog is anything like mine are, he/she will be sent into a tizzy, and will pace around the kitchen, whimpering and pleading for just a sampling of your duck. Why steam? In the episode, Alton, or rather his plumber, explains that it is a gentler cooking method than water, is more efficient than air, and it does not wash away the seasoning. 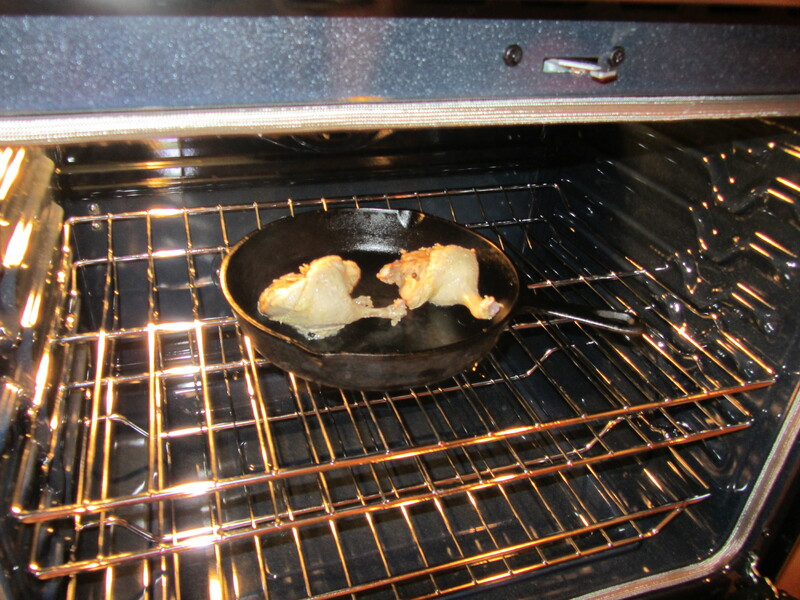 Toward the end of your steaming, heat your oven to 475 degrees, placing a cast iron skillet inside. When the steaming is complete, set the steaming water aside, place the duck legs into the skillet, skin side down, and cook them for 10 minutes. Duck quarters after steaming for 45 minutes. Duck legs in hot skillet. After 10 minutes, use tongs to move the legs up to the sides of the skillet, and add the breast quarters to the pan, skin side down. Cook the duck for an additional 7 minutes. 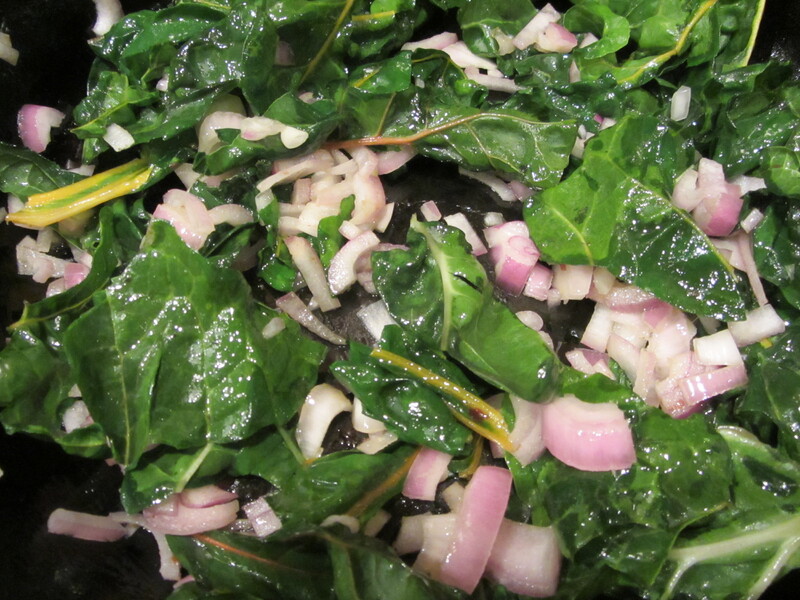 While the duck cooks, shred some chard and chop a couple of shallots. Duck breasts added to skillet with legs. When the duck is done, let it rest on a plate, covered with foil; a small, upturned bowl in the center of the plate gives the duck something to lean against, keeping it from sitting in its own juices. While the duck rests, add a couple handfuls of shredded chard to the hot cast iron skillet, tossing with tongs. 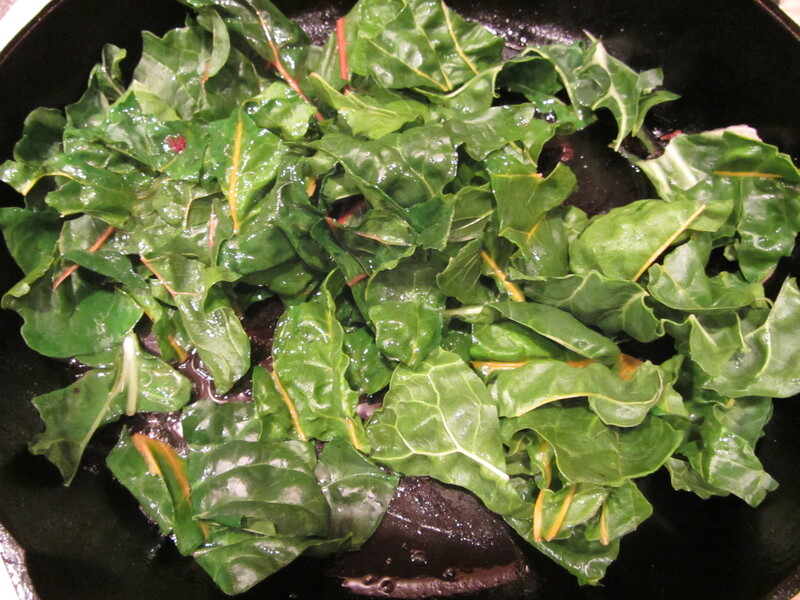 Chard added to hot duck skillet. The skillet will be hot enough that you can do this off of heat. 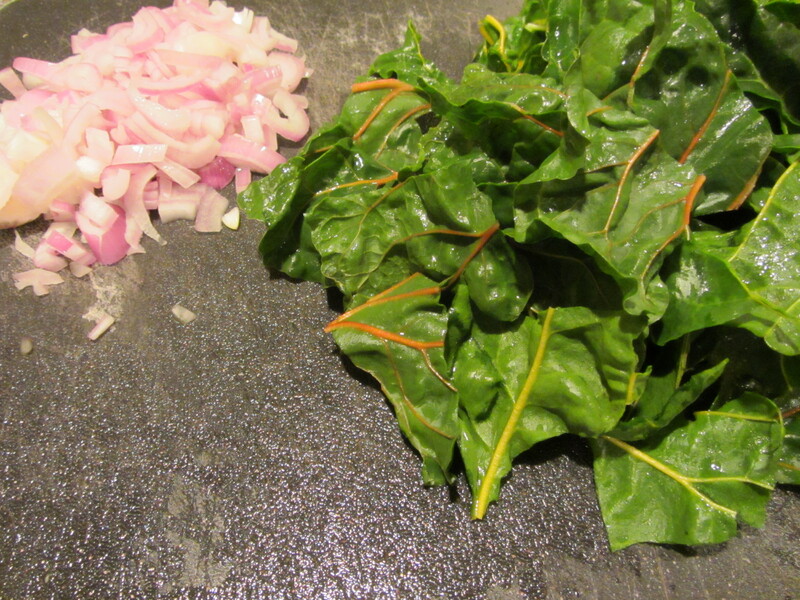 Add some chopped shallots to the chard, toss until wilted, and sprinkle with some balsamic or sherry vinegar. Chard and shallots in hot skillet. 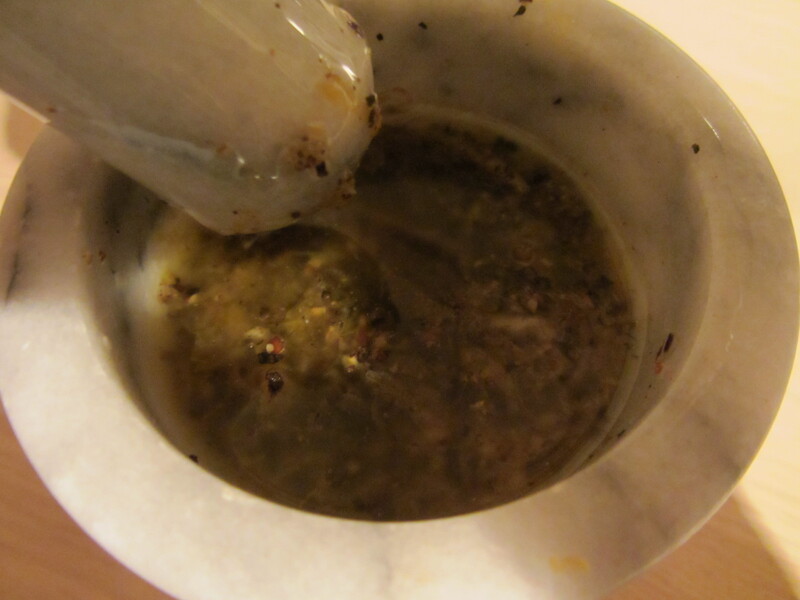 Remember that cooking liquid that remained after steaming? The water portion of that liquid can be boiled away until all that remains is wonderful duck fat. Steaming liquid, boiling down to duck fat. Alton recommends simmering some cubed red potatoes in salted water before sautéing them in a little duck fat over high heat. 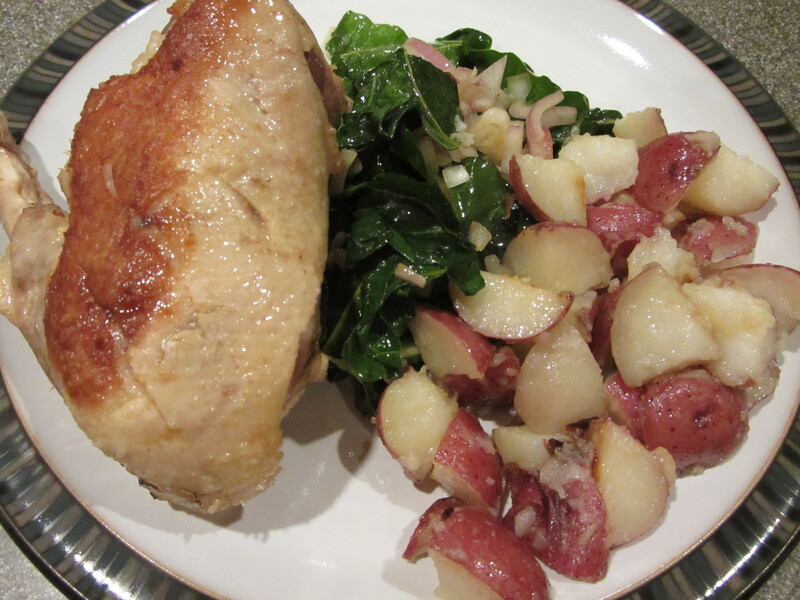 I just could not resist that idea, so I heeded his advice and made some duck fat potatoes to go with our duck and chard. 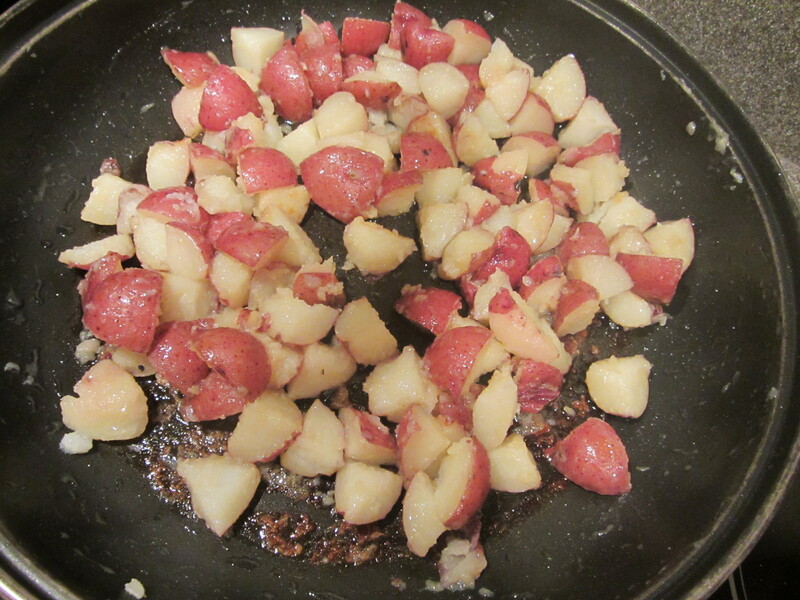 Red potatoes to saute in duck fat. 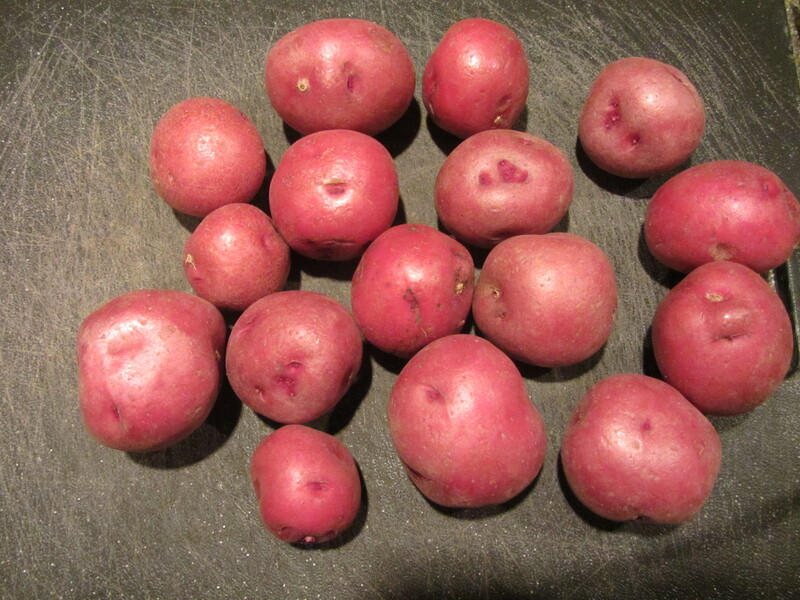 Red potatoes, after simmering in salted water. Potatoes cooked in duck fat. Duck, potatoes cooked in duck fat, and chard. I can admit that I experienced some trepidation upon seeing I would need to butterfly a chicken for the 5th episode of Good Eats. 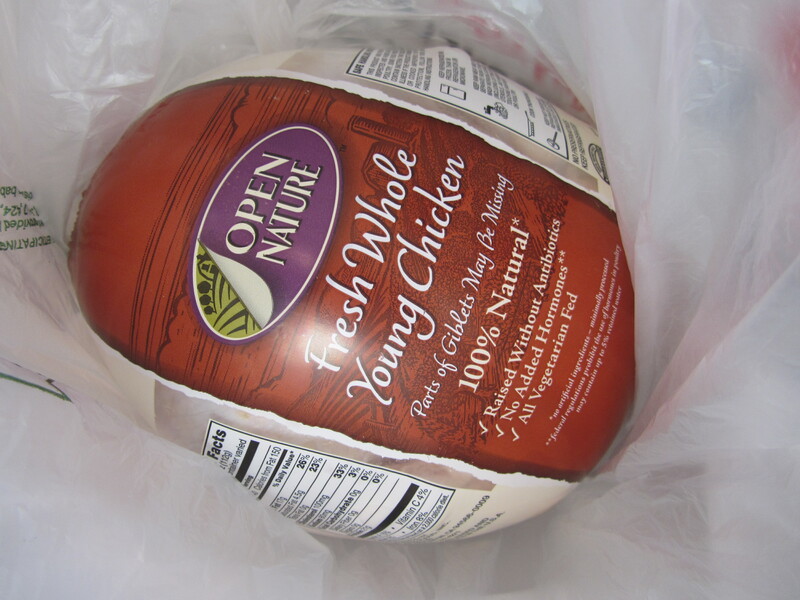 As a child, I shrieked in horror upon seeing our family’s naked Thanksgiving turkey sitting on the kitchen counter. Fleeing the room, I was chased by my older brother who had a handful of giblets. Ever since, I have really not liked the appearance of uncooked fowl. Really, though, can anyone truly say they find raw chicken appetizing? It’s an odd shade of yellowish pink, slimy, slightly sticky, and covered by prickly yellow skin. Still, amazingly, the cooked version can be quite tasty. The smallest chicken we could get at our grocery store was five pounds, while Alton’s recipe calls for a three or four pound bird. I made my paste of peppercorns, garlic, salt, lemon zest, and olive oil, and filled my roasting pan with carrots, onions, and celery. Then it was time to face the bird… DUN, DUN, DUNNN!!! Veggies in the roasting pan. Garlic, pepper, lemon, salt, and oil paste. I placed my chicken (I called her “Sally”) on my board and cut down both sides of the back bone. This part was actually pretty easy. The keel bone, however, proved to be harder to remove than it was when Alton did it on the show. I pressed down on her until she was flat, loosened her skin, and spread the paste under her skin. Then I oiled her up and placed her on top of the veggies in the roasting pan. My oven rack was 8 inches from the broiler, as recommended in both the episode and online recipe. This proved to be too close, as Sally’s breasts were getting too dark too quickly. It was fine after lowering her to the very bottom rack. Ready to flip. Breast got a little too dark. The online recipe tells you to check the bird after 10 minutes of cooking. The episode, on the other hand, tells you to check after 18 minutes. Since my bird was larger, I checked her after 18 minutes, and decided to let ‘er go for another couple minutes before flipping her over. Her derriere took considerably longer also, and she ended up cooking for a total of nearly an hour before she was at 165 degrees. While Sally rested in the shade of a foil-covered bowl, I deglazed the roasting pan and made the jus. I cut Sally into quarters, making incisions to catch the jus, drizzled her with jus, and topped her with a lemon wheel. Ted declared Alton’s chicken to be delicious, and I think it’s safe to say that he is happy I am pursuing this project.